Product #20847 | SKU SASXD5000 | 0.0 (no ratings yet) Thanks for your rating! 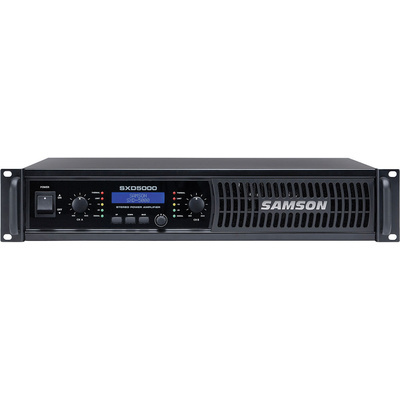 The SXD5000 Power Amplifier with DSP by Samson is for live sound reinforcement. It is used in various environments in audio applications to provide clean power for speakers such as in DJ setups, houses of worship, front of house, live stage performance and more. It features 750W power per side at 4 Ω. This amp is designed to provide clean output with low distortion and a wide dynamic range over a frequency spectrum of 20 Hz to 20 kHz. The SXD5000 is built with advanced DSP and is controlled via a backlit LCD for use in low-lit environments. The power amp provides extensive control over high and low pass filters, a 3-band EQ, output limiter and delay time for speaker alignment. It also features four presets to provide optimal settings for various standard speaker configurations. A digital pass code security lock is also provided. All of the SXD5000's amp channels offer multi-segment LED metering and level controls with detents. Settings of gain and sensitivity can be monitored on the front panel LCD. Input connections for the power amp are made via balanced combination XLR and 1/4" connectors. The amp provides both Binding Post and Speakon connectors for speakers. It is built with an all-steel chassis in a 19" rack mount design and has convenient carry handles making it ready for the rigors of the road. A power cord in included.